Q. Why should my company be certified? Q. What is the fee for certification, and what does it cover? A. The cost of certification for CLLA members is $1,000 for agencies with 5 to 20 employees; $1,700 for agencies with 21 to 49 employees and $2,450 for agencies with over 50 employees. The cost of certification, in general, is all-inclusive, including credit reports, four background checks and an on-site audit. Q. How often will you conduct an on-site inspection? A. The on-site inspection is conducted the first year of the program, and there is a recertification in the fourth year. As an example, on-site inspections will be conducted in 2014, 2017, 2020 and so on. This is assuming, of course, your agency has not experienced a significant change in ownership or operations. Q. What will you be looking for during an on-site inspection? A. The on-site inspection will be reviewing such areas as accounting and payment processing, compliance, facility security, quality assurance, and sales and marketing activities. Q. Will I be able to use the Certified Commercial Collection Agency seal once I’m certified? A. Once you meet all certification requirements and are certified, you are free to display the seal on your website and in your marketing materials. Q. Will the CLLA support and promote the certification program to credit grantors? A. The CLLA is the oldest creditors’ rights organization in the U.S. We have excellent brand recognition with credit grantors, and we will continue to market the importance of this certification program to credit grantors through advertising, public relations and trade show participation. In addition, we intend to provide certified agencies with materials they can use to promote their certification. Q. Am I guaranteed certification by paying the certification program fee? A. No. However, the CLLA certification program is fair and objective. Your application is not subject to a subjective review by your competitors. Nor is our certification a “rubber stamp” for paying a fee. The CLLA certification program includes clear and objective requirements. The requirements are uniformly applied and interpreted. You will know exactly what is required to be certified and what you need to correct if you do not initially meet the program requirements. Q. Who will be reviewing my financial records and conducting an on-site inspection? A. The CLLA has overall authority and responsibility for the program. Portions of the application and related documents will be confidentially reviewed by an impartial committee of CLLA staff and executives. The CLLA has contracted with Acumen Solutions Group, LLC to assist it in processing certification applications and conduct on-site inspections. Acumen is a full-service ARM support company, offering several products and services designed to meet specific and complex auditing, compliance and risk planning needs of ARM trade organizations, network management companies, collection agencies, debt buyers and law firms. Acumen currently performs independent, third-party compliance audits on behalf of passive debt buyers and legal and agency network management firms. In addition, Acumen has received recognition as a DBA International “Approved” Independent Third Party Auditing Firm for the performance of compliance audits for the Debt Buyer Certification Program. Q. How do I fulfill the continuing education requirement? A. 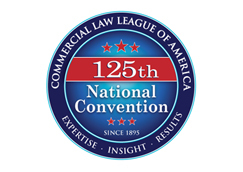 Most CLLA conferences offer continuing education requirements for the representatives of certified agencies. In addition, the CLLA will honor course attendance at other commercial collection conferences, such as the American Collections Association (ACA) and the International Association of Commercial Collectors (IACC). Q. If I have any questions, who can I call? A. CLLA Director of Education Lillian Novak is your contact for any questions on the education program. You can email her at lillian.novak@clla.org. Q. What is the IACC/CLLA Alliance? A. In September 2014, the International Association of Commercial Collectors entered into a strategic alliance with the CLLA, which is primarily focused on the agency certification program. Q. Will CLLA and IACC members have any input with regard to the certification program or the marketing of the program? A. As a part of this alliance, a Strategic Alliance Advisory Committee (SAAC) has been created. This committee will be comprised of three IACC members and three CLLA members, as chosen by each association. The committee will be responsible for making recommendations regarding promotion and marketing of the certification program, as well as providing input on education, in support of CLLA and IACC meetings and events. Q: How will the certification program be marketed? A: The agency certification program will have its own advertising fund, separate from the IACC’s or CLLA’s respective general operating funds, and will be marketed to the industry based on the consideration and recommendation of the Strategic Alliance Advisory Committee. Q. Will I need to be a member of both IACC and CLLA? A: If you wish to apply for Agency Certification your agency will need to be a member of IACC and one designated officer, manager or representative of the agency will need to be a member of the CLLA during the period of certification. Q. Are there any discounts for joining either IACC or CLLA? A: A 20% discount on your initial dues is being provided by each association. If you are a member of IACC but need to join CLLA, you will receive a 20% discount off of your CLLA dues, and vice versa for those agencies that need to join IACC. Note: Annual dues beyond the initial membership year will be at the regular rate. Q: Are the IACC meetings qualifiers for the CLLA certification program? A: Yes. The IACC meetings will now be considered CLLA-qualified educational events for the requirement of the agency certification program.